This page explain where to download the software necessary for the workshop and how to install it on the attendants computers (as mentioned in the program the attendants will participate in the workshop using their own laptops). 1 – Rhinoceros. Surface modeling software - website http://www.rhino3d.com/. On the download web page of this software http://www.rhino3d.com/download it is possible to download a trial version of Rhino 5 for Windows that will run for 90 days (consequently in case educational version can be purchased). There is also Rhino 5 for Mac but it is suggested to use a Windows operative system on Mac because the other software won’t run on Mac. Install Rhinoceros in the normal program folder. For further use of the software a large quantity of learning material is available at http://www.rhino3d.com/tutorials. 2 – Ecotect Analysis. This is an environmental analysis software. An educational version of this software will be made available to download by the tutor for the attendants. The link and installation instructions will be sent by email. 3 – Grasshopper. Parametric and generative design software - website http://www.grasshopper3d.com/. On the download page of this software http://www.grasshopper3d.com/page/download-1 download the version Latest Grasshopper for Rhino 5.0 (Windows only) version 0.9.0076. After having installed and run for already one time Rhinoceros, install Grasshopper with the preferred option in the installation wizard (no need to specify a folder). After having installed to run the software it is necessary first run Rhinoceros then in the command line type the word grasshopper (a license agreement will pop up just check and confirm). For further use of the software a large quantity of learning material is available at http://www.grasshopper3d.com/page/tutorials-1. An excellent manual is available here http://grasshopperprimer.com/en/index.html. 4 – Ladybug and Honeybee. 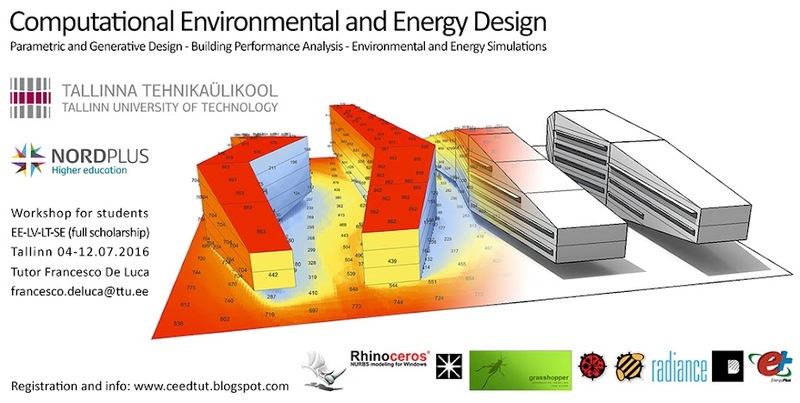 Environmental, daylight and energy tools and interface with simulation software for Grasshopper – website http://www.grasshopper3d.com/group/ladybug. Download the .rar file archive from this link https://dl.dropboxusercontent.com/u/3166661/CEEDTUT/LB-HB.rar and extract all the files in the folder in your computer C:\Users\YOURNAME\AppData\Roaming\Grasshopper\UserObjects (YOURNAME is your user name on your computer). 5 – Download the file ghpython.gha (Python interpreter component for Grasshopper) from this link https://dl.dropboxusercontent.com/u/3166661/CEEDTUT/ghpython.gha and place the file in the folder in your computer C:\Users\YOURNAME\AppData\Roaming\Grasshopper\Libraries (YOURNAME is your user name on your computer). 6 – Radiance. Daylight analysis software, website http://www.radiance-online.org/). Download the executable file from this link https://dl.dropboxusercontent.com/u/3166661/CEEDTUT/radiance-5.0.a.6-win64.exe. VERY IMPORTANT: install this software in C:\Radiance (the folder doesn’t exist, you will have to create it during the installation process otherwise the Windows installation wizard will try automatically to install it in a different folder). Also for this software there is a good availability of learning materials at http://www.radiance-online.org/learning. 7 – Download the file falsecolor2.exe from this link https://dl.dropboxusercontent.com/u/3166661/CEEDTUT/falsecolor2.exe and copy it in the folder in your computer C:\Radiance\bin. 8 – Daysim. Annual daylight analysis software, website http://daysim.ning.com/. On the download page of this software http://daysim.ning.com/page/download fill the form and download the version 4.0 for Windows (executable version). VERY IMPORTANT: during the installation double check that the program is installed in the folder C:\DAYSIM. 9 – EnergyPlus. Energy analysis software, website https://energyplus.net/. Download the version 8.4.0 from this link https://github.com/NREL/EnergyPlus/releases/tag/v8.4.0 (version EnergyPlus-8.4.0-832e4bb9cb-Windows-x86_64.exe). VERY IMPORTANT: during the installation double check that the program is installed in the folder C:\EnergyPlusV8-4-0. 10 – Download the file MeshEdit.gha (shadows meshes generator in Grasshopper by UTO) from this link https://dl.dropboxusercontent.com/u/3166661/CEEDTUT/MeshEdit.gha and place the file in the folder in your computer C:\Users\YOURNAME\AppData\Roaming\Grasshopper\Libraries (YOURNAME is your user name on your computer). 11 – Download the file EmbryoViz.gha (images visualizer inside Grasshopper) from this link https://dl.dropboxusercontent.com/u/3166661/CEEDTUT/EmbryoViz.gha and place the file in the folder in your computer C:\Users\YOURNAME\AppData\Roaming\Grasshopper\Libraries (YOURNAME is your user name on your computer). 12 – Download the TT Toolbox (a range of different tools developed by the Core Studio at Thornton Tomasetti) archive tttoolbox1.7.zip from this link https://dl.dropboxusercontent.com/u/3166661/CEEDTUT/tttoolbox1.7.zip. Once downloaded copy the entire folder TT Toolbox in the folder in your computer C:\Users\YOURNAME\AppData\Roaming\Grasshopper\Libraries (YOURNAME is your user name on your computer). 13 - Microsoft Office 2013 (or newer version). It will be important to use Microsoft Excel. Now you have all the necessary software installed.